In digital marketing, you move people toward a conversion by creating relationships with them. As you run paid traffic campaigns, you need to understand where you stand in your relationship with your leads and customers. Are they just now learning about you; are they aware of you but haven’t bought from you; have they bought from you and now you’re working to turn them into lifelong customers and raving fans? Cold traffic: These are people who have never heard of you, your brands, or your products or services. You have no relationship with these people, but they are important because they bring new leads and sales to your business. You must build trust, credibility, and authority with your cold traffic. Before they agree to buy from you, they need to prove that your brand is a worthy investment of their time and money. Make ungated offers to valuable content on your blog, podcast, or YouTube channel to cold traffic. 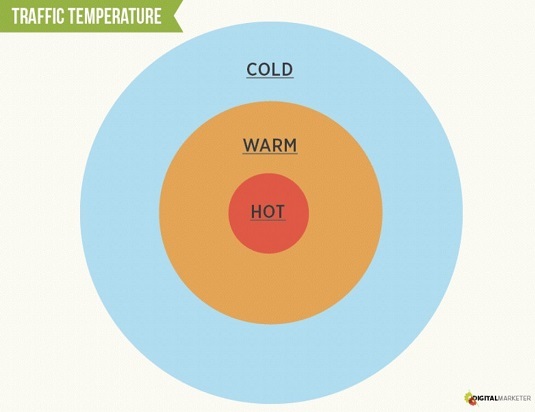 Warm traffic: These are people who have heard about you or engaged with your brand but haven’t bought from you. They may have read your blog, listened to your podcast, or joined your email newsletter. People in the warm traffic stage are evaluating whether they like what you say, and are interested in learning more and possibly purchasing from you. They’re deciding whether your company is the best option to solve their problem. They’re also evaluating your competitors to see whether they do it better or more cheaply. Make entry point offers and gated offers to these folks to get them in the door without much risk. Hot traffic: As you’ve probably guessed, these are people who have bought from you. They may be first-time buyers to repeat buyers. These are the customers you have already spent time, money, and energy to acquire. The biggest mistake that advertisers make is concentrating only on bringing in new leads and sales. The savvy marketer also uses paid traffic to sell more and more often to the customers he already has. Make profit maximizer offers to hot traffic. The three stages of traffic temperature. Introduce yourself to cold traffic with valuable content. Convert warm traffic to leads and low dollar buyers. Sell more and more often to existing buyers.